A portrait of Averell Harriman, the founder of Sun Valley Resort and heir to one of America's most legendary fortunes, used to preside above the hearth in the lobby of the Sun Valley Lodge. It has been replaced in recent years with a photograph of Earl and Carol Holding, the current owners of the resort. The old portrait, of Averell smiling in a Tyrolean jacket, recently reappeared near the front desk of the lodge. "Now he looks like head bell cap," jokes his grandson Averell Fisk, after a drink or two in the resort's Duchin Lounge. Tall and good-natured, with a dash of insouciance, Averell Fisk is a grandson of Averell Harriman and his first wife, Kitty Lanier. He spent time here during summers as a boy, packing a fly rod and picking out a horse from the Sun Valley stables before riding out from the Harriman Cottage with Sepp Froehlich, one of the early directors of the Sun Valley Ski School. "Sepp was a fabulous fisherman. We would cook and eat what we caught right at the river and be back home by 9 o'clock. Sepp cooked the fish in corn flakes and butter. I brought the bacon," he said. Fisk became good friends with Jack Hemingway, whom he described as a "fascinating" person, but found that his father, author Ernest Hemingway, could be a bit gruff and did not seem to care much for the questions of young children. Fisk worked on the Sun Valley Ski Patrol from 1969-70 and was the first president of the guest services department. Ski racer Jean Claude Killy was one of the many people he met. He remembers sharing a ride on the ski lift with Raquel Welch during a ski special. He noted that together with her good looks, she could also swear like a sailor. 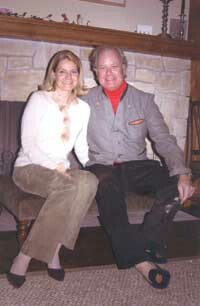 Fisk and his wife, Kirsten, recently bought a home in Ketchum. The Fisks also share the Harriman Cottage, which was recently removed and rebuilt near Sun Valley Lake, as per an old agreement with the company his grandfather founded in 1936, while serving as the CEO of Union Pacific Railroad Co.
"They [Sun Valley] could never get the eggshell blue color right on the cottage," he said. Fisk had a home in Spain for some years, lived in Palm Beach, Fla., kept a boat in Antigua where he raced in regattas, and used to spend a fair amount of time in England, playing polo with the likes of Prince Charles and shooting. He recently rode in the Millbrook Hunt, with a 90-year old tradition of fox hunting in Duchess County, N.Y., reminiscent of the centuries-old tradition in England. Fisk learned to ride on a mare named "Mousie," given to his grandfather by Josef Stalin. In 1920, his grandfather, an eight-goal (a rank that would have put him on par with most professionals) polo player, paid $200,000 for a polo pony named Lord Firestone. Some of Fisk's fondest memories are of skin-diving and spear-fishing in Trinidad and Tobago as a young man, spearing fish as deep as 100 feet. He gets a little mystical talking about the ocean, about sharks especially, and a bit miffed when considering the unfortunate depletion of ocean resources by countries such as Japan. Fisk understands business. He learned to play polo indoors while studying for an advanced business degree at Columbia University. Fisk accompanied his grandfather on political campaigns when he was very young, but did not grow up to share Harriman's high regard for the Democratic Party. Averell Harriman served as special envoy to President Franklin D. Roosevelt during World War II, and headed the lend-lease program following the war with Winston Churchill, later serving as ambassador to Russia and the United Kingdom. He also ran twice on the Democratic ticket for the U.S. presidency. Yet Fisk is a proud a Republican. "I think the Democratic Party has lost its way. Capitalism built this country, the separation of church and state and the separation of the rights of states and of individual citizens. This has been circumvented by big government, big spending and entitlements, which have usurped individualism. There is an incredible corruption in our politics," he said. Fisk spends part of the year in upstate New York at Arden Farm, a once 50,000-acre estate formed by his great grandfather, the railroad magnate E.W. Harriman. Averell and Kirsten Fisk were married at the 100-room Arden House, built by the same Italian masons and German woodworkers who fashioned A.H. Harriman's many fortress-like railway stations around the turn of the 20th century. Fisk said the Arden House was owned for many years by Columbia University before being bought back by "the cousins" and recently sold to "the Koreans," who will be required to perform a $30 million remodel on the historic building. "It cost more than $100,000 a month to heat the place," he said. As for the ski resort that his grandfather founded, Fisk said the future looks bright. "Bill Janss was a great skier and enthusiastic sportsman. On the other hand, Earl Holding has done amazing things. He has done an excellent job as a steward of Sun Valley. He has left it in trust to his grandchildren so Sun Valley won't change too much in our lifetimes. "This place still has a lot of the soul that was here in the early days. Sun Valley is a very special place. It is a small town where everyone knows one another and looks out for one another. You don't have that in Vail or Aspen."